I’ve always loved the Sailing By theme music that precedes the shipping forecast every evening on Radio Four. I associate it with floating off to sleep, but of course for mariners, it’s the signal to listen up for the information on which your life may depend in the coming 24 hours. The theme was written in 1963 by the splendidly named Ronald Binge, and it is a circular piece, meaning it can be played for as long as necessary to fill in the time between the end of the midnight news and the start of the forecast. I love the sea and I love to see white sails as I look down from my office window over Cardigan Bay. I must have one of the best views in the world – and one of the best commutes, up the coast road from Aberaeron to Aberyswyth. I suppose I picture life as a voyage. As we set sail, we regularly re-chart our course and life tempts us to set foot on shores we often hadn’t dreamed of visiting. It often beaches us where we least expected it. And sometimes it throws storms or doldrums into our path, but by setting the right sails and paying attention to the most favourable winds, the majority of life is a pleasurable as sailing on a calm sea can be. 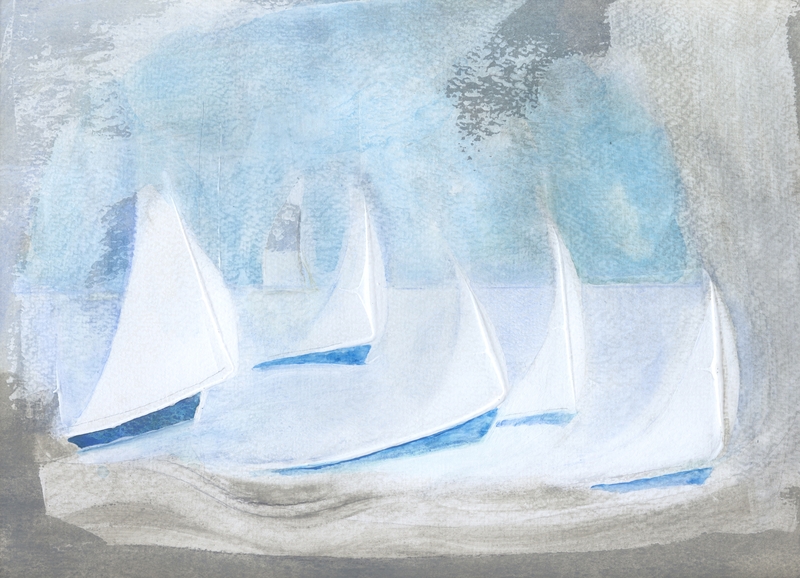 This painting is one of a series inspired by Sailing By. The Picturemakers are using this particular image on some of the posters for our next exhibition at Morlan as part of the Ceredigion Arts trail from 21st August till 30th September. You can meet the artists on August 25th and help us raise money for Y Falch Gobaith, the Beacon of Hope. This entry was posted in Art, Not Work, Uncategorized and tagged Beacon of Hope, Ceredigion Arts Trail, Picturemakers, pictures, PMs. Bookmark the permalink.